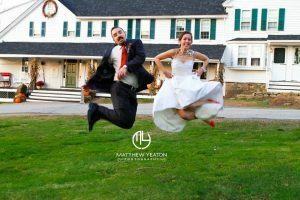 Whether it is our 18th Century barn with fieldstone fireplace or the beauty of the White Mountains behind you at our tent wedding, Christmas Farm Inn is a magical combination of historic and photogenic. Make sure that when discussing the photos you want with your photographer, you set aside time to get bridal portraits or shots as a couple in the best romantic spots. The covered “Honeymoon Bridge” spanning the Ellis River is a must for any newlyweds to pose at. That may sound easier than it is when there are so many details to pull together, but you don’t want to look stressed out or upset when you can be smiling and happy as you wear your gorgeous gown. Try to forget about minor problems and go with the flow. You can minimize your stress by working with a wedding planner, relying on friends and family and trusting our recommendations at Christmas Farm Inn. Have a flexible plan that incorporates the aspects you’ve envisioned and be sure to communicate this before delegating tasks. This day is about you and your love. Focus on that. Not merely the affection you feel for your soon-to-be spouse, but also those who drive long distances to share in this special occasion with you. This day is about making memories and cherishing what’s important: connection. You’ll have better wedding photos if it shows in your interactions with everyone you encounter. Make the most of your time visiting with people you love and let that love for them shine through. If there are strained relationships such as divorced parents or siblings who do not get along, there’s no reason for these to ruin your big day as long as people know how you expect them to behave and your photographer is aware of the tension so he/she avoids putting people who dislike one another in close proximity for pictures. 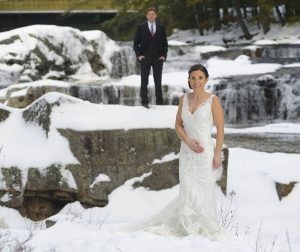 Your wedding can follow every tradition there is and your album still be uncommonly interesting to look at if you tell your photographer that you want really natural pictures that capture the fun of the day rather than merely just recording how everyone looked in a tux or dress standing in a line for formals. Get shots of you and your bridesmaids laughing while getting a treatment at the Christmas Farm Inn’s AVEDA Concept Spa. Ask for photos of your little cousins playing with the fall foliage changing behind them. Get images of the groomsmen enjoying a cocktail in the Mistletoe Pub. Encourage your guests to tell the photographer if there are fun surprises or touching moments planned. As long as they do not get in the way and prevent your photographer from capturing one of the moments you requested be photographed, your friends and family can often add something special by taking photos with their smartphones and other cameras. They may have a deeper understanding of inside jokes, grasp the family dynamics and capture the action from several different angles. Make sure you talk with your photographer and know his or her policies about other people taking photos. We hope these 5 easy tips help you plan your walk down the aisle. We look forward to seeing you at Christmas Farm Inn and Spa!